NEW CANAAN — It’s been a busy month for the Kwei-Choi family, and their community has lend a helping hand. 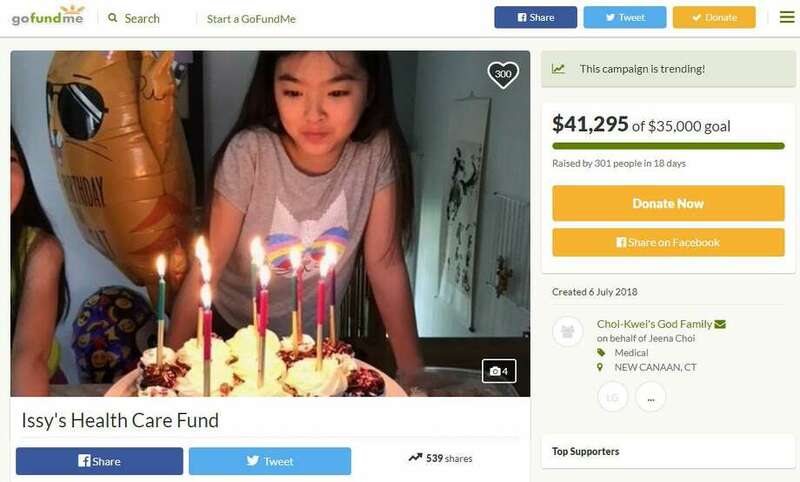 Issy Kwei-Choi, a 12-year-old and oldest daughter of Jeena and Frank Kwei-Choi, underwent surgery on July 4 at the Yale New Haven Hospital to have a cerebellar tumor by her brain stem removed. After an eight-hour surgery, Issy was declared “tumor-free” but the process for rehabilitation has just started. Issy was discharged from the Yale New Haven Hospital last Friday and is now at the Hospital for Special Care in New Britain, her father said. Medical expenses for this type of treatment are expected to be between $250,000 and $500,000, and community members in Wilton and New Canaan have stepped in to help. A GoFundMe page created July 6 by family friends has, as of press time, raised $41,295 with 301 people pitching in. The amount supersedes the original goal of raising $35,000. The Kwei-Choi parents were humbled by the amount of people that had reached out. Jeena is a real estate agent in Wilton and Frank is the director of hospitality at the Grace Farms Foundation. Following Issy’s move to New Britain, the family alternates times to stay with their daughter at the hospital. Adam Thatcher, director of operations at Grace Farms Foundations, has known Frank for the past four years. “I can easily say that (the family) are more than appreciative and blown away by the community outreach and support that their family has received from friends and also strangers and people from school, New Canaan and Ridgefield,” Thatcher said. An update on the fundraiser’s page July 16 stated the family had been appreciative of the community support. Friends of the family have also expressed their support and gratitude for the help received online. “We’re blessed for the outpouring of support from the Wilton and New Canaan communities,” Veena Verma-Dzik, a close friend of the family, said.